A creative workshop with time to explore and experiment with natural colour from plants and their effects on natural fibres. Using a variety of techniques, learn how to make beautiful unique patterns on fabrics, using plants easily found around your home and local environment. Perfect for any enthusiast of textiles, from sewer to weaver, felt maker or quilter. Learn to create a palette of colours and patterns you can transform into many beautiful items. 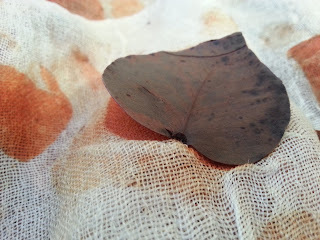 ﻿Beginning with submersions dyes made from a variety of plants and barks, then moving on to eco prints using leaves, flowers and barks to mark and print onto fabrics. We will also look at pre-mordanting fabrics and its effects. Day two will be unwrapping bundles and exploring further techniques such as folding of cloth and overdyeing to achieve more complex pattern and colour combinations.. Each participant will go home with their own piece of textile art as well as notes for experimenting further at home. A sample pack of fabrics such as silk, wool and silk thread will be provided in the course fees, as well as a scarf and cushion cover for the second day piece. This pack is worth $40 and is included in the price. You are also welcome to bring in natural fabrics of your own to experiment with, such as silk, wool or felt. Some other small quantities of fabrics will be available to buy on the day. Gina Mastio is an Australian textiles and clothing artist with a passion for the environment and a strong ecological conscience. She has exhibited in France and Australia and her works are in international private collections. Class fee includes morning tea and lunch. I've been playing with paper recently, exploring leaf printing on different types of paper. A lovely way to pass some time on the deck, in the breeze. I also like the layers of leaf litter you can create, much like lovely mulch on forest floors. A nice activity to do with kids too. How about an eco birthday invite? To a craft party..? I've been enjoying getting back to the dye pots on the deck since returning to Australia. All these lovely homegrown beauties in my neighbourhood, waiting to be picked up from the ground and made into lovely colour and shape on textiles. A woven wool wrap, fine and light, perfect for a light chill in the air. I love wearing these over a summer dress, so easy to pack in the bag for a surprising sea breeze.